I began tracking Leosat's Internet service project in 2015 before I began contributing to CircleID. The following is my original post, with subsequent updates on their progress including an investment by the Japanese geosynchronous satellite company SkyPerfectJsat and an agreement for satellite development with Thales Alenia Space will develop the relatively. I've been tracking Greg Wyler and Elon Musk's plans to launch low-Earth orbit satellites to provide Internet connectivity. Musk's SpaceX and Wyler's OneWeb have been joined by a would-be low-Earth connectivity provider, Leosat. Leosat will not be marketing to individual end users but will target government and business — maritime applications, oil and gas exploration and productions, telecom back-haul and trunking, enterprise VSAT, etc. Their market seems closer to Wyler's former company O3b, but Leosat plans to cover the entire Earth, while O3b is restricted to locations near the equator. They plan to offer encrypted connectivity at up to 1.2 gbps with latency under 50 ms using a constellation of 80 to 120 small satellites, with launches beginning in 2019 or 2020. While SpaceX and OneWeb have focused their publicity on end users and developing nations, they will also have the ability to deliver low latency service over long distances. As shown below, a terrestrial link from my home in Los Angeles to La Universidad de Magallanes in Punta Arenas, Chile required 14 hops whereas a satellite route could be achieved with five hops. (The following illustration is drawn to approximate scale assuming a satellite altitude of 700 miles). 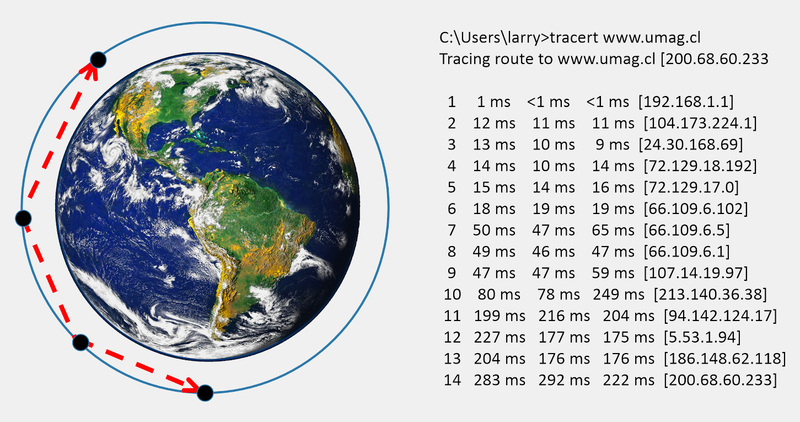 The Ping time for the terrestrial link averages around 224 ms, considerably slower than the sub 50 ms latency Leosat hopes to achieve. Like many Americans, I am served by a monopoly Internet service provider. Might these folks actually be able to provide competition — at least in the developing world — some day? Leosat, which recently received an investment by Japanese geosynchronous satellite company SkyPerfectJsat, has announced rough milestone dates for their LEO project. They plan on offering store-and-forward service using two "early bird" satellites in 2019. In 2021 they will begin launching the rest of their 108-satellite constellation. Completion of the constellation and full worldwide service is planned for 2022. (Their initial store and forward connectivity is reminiscent of VITAsat, which offered 38.4 kbps email service in Africa in the 1990s). Judging from the illustration, they seem to be planning both polar and inclined orbits like Telesat. 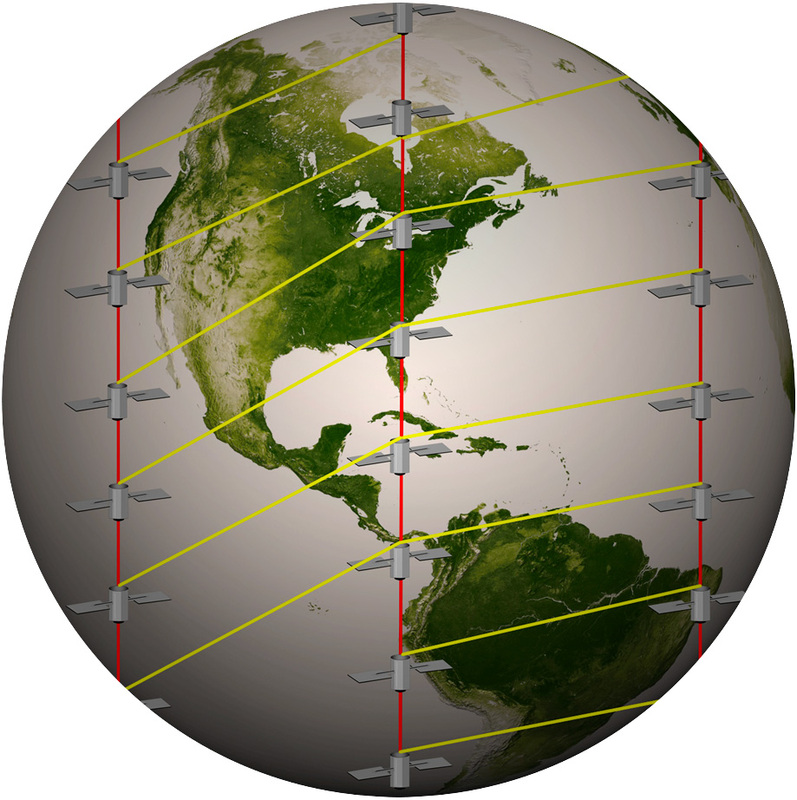 Leosat seems to be planning a mix of polar and inclined-orbit satellites. In this interview (5:31), CEO Mark Rigolle says they will focus on point-point connections rather than linking to terrestrially connected ground stations. Doing so will cut latency — he estimates 119 ms between Singapore and London. These point-point links will also be more secure than those using the terrestrial Internet. These features will appeal to enterprises needing to synchronize databases, financial trading firms, firms with a lot of sensitive data online, etc. Thales Alenia Space will develop the relatively large, 670 kg satellites will have four optical links to other satellites, 10 Ka-band steerable antennas, each providing up to 1.6 Gbps of symmetrical data connectivity and two steerable high-performance antennas, each providing up to 5.2 Gbps of symmetrical data connectivity. With their emphasis on speed and security, they are focusing on a premium market in contrast to OneWeb or SpaceX, which hope to provide affordable connectivity to homes, schools, community centers, etc. as well as long-distance links like the one illustrated above. I also found their patent application for a "System and method for satellite routing of data" on Google, but could not find one in the US Patent Office database. I am not sure why that is nor am I sure what patent-worthy unique invention they claim. This, along with their recent SkyPerfectJsat investment is an indication that they are making progress and focusing on high-end, fast, secure links. In a talk at the opening of the SpaceX office in Seattle, Elon Musk predicted that they would get 50% of the long-haul Internet traffic. It seems like Leosat will be a strong, focused competitor. (Note that Musk also based his prediction on inaccurate assumptions). Local Time: Tuesday, April 23, 2019 09:04 PM PDT – Page Load: 0.2783 Sec.